Carrot Bread recipe by Marium Hamid at DesiRecipes.com. 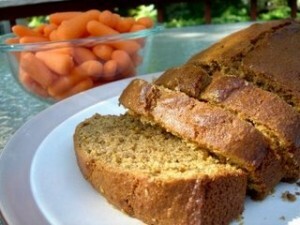 Make this delicious, moist carrot bread with a few basic ingredients and these step-by-step instructions. I bet you and your family will love it. 1/2 cup raisins (kish mish). Lightly butter a 9"5 inch loaf pan. In a mixing bowl, whisk together flour, baking powder, baking soda, pinch of salt and spices. In another mixing bowl cream butter and suger until light. Add honey , eggs, 1 by 1, orange zest and juice. Fold wet ingrediants into dry ingrediants. Add carrots and raisins to batter and transfer it to prepared loaf pan and bake in middle of oven for 45 minutes or until a toothpick when inserted in center comes out dry. Rest on a rack for 15 minutes turn out, cool on a rack.